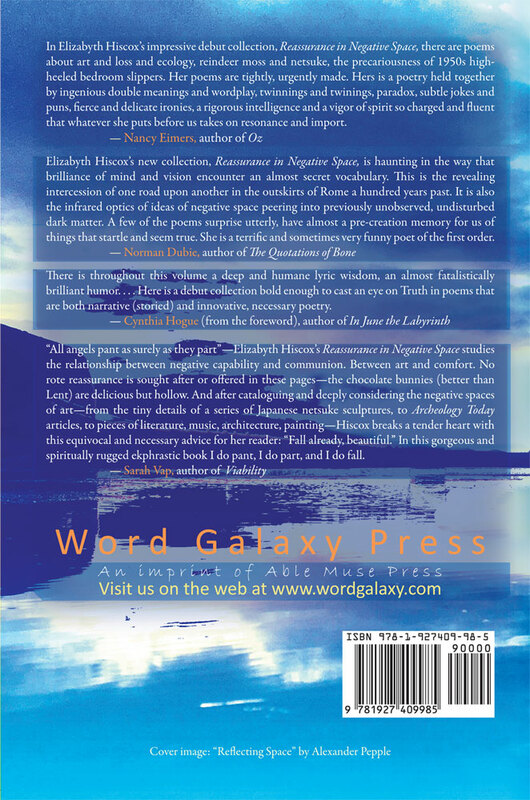 Elizabyth A. Hiscox's Reassurance in Negative Space is a debut collection with the seasoned deftness of a master in its keen intelligence, wit, innovative diction, unflinching handling of loss and grief, and deep lyricism. Hiscox muses with revelatory insights on such wide-ranging topics as multifarious netsuke, nuclear fallout, artichokes “coming into new brilliance,” the DMV line, the Zen of “the sublime [that] can spring from small things.” By turns ecstatic and somber, profane and sacred, wise and whimsical, Hiscox proves she is a poet of the first order with this memorable collection. In Elizabyth Hiscox’s impressive debut collection, Reassurance in Negative Space, there are poems about art and loss and ecology, reindeer moss and netsuke, the precariousness of 1950s high-heeled bedroom slippers. Her poems are tightly, urgently made. Hers is a poetry held together by ingenious double meanings and wordplay, twinnings and twinings, paradox, subtle jokes and puns, fierce and delicate ironies, a rigorous intelligence and a vigor of spirit so charged and fluent that whatever she puts before us takes on resonance and import. 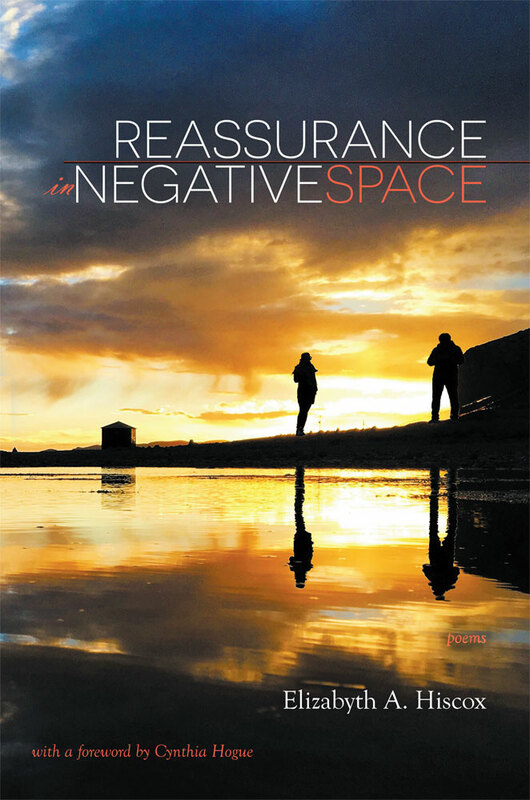 Elizabyth Hiscox’s new collection, Reassurance in Negative Space, is haunting in the way that brilliance of mind and vision encounter an almost secret vocabulary. This is the revealing intercession of one road upon another in the outskirts of Rome a hundred years past. It is also the infrared optics of ideas of negative space peering into previously unobserved, undisturbed dark matter. A few of the poems surprise utterly, have almost a pre-creation memory for us of things that startle and seem true. She is a terrific and sometimes very funny poet of the first order. There is throughout this volume a deep and humane lyric wisdom, an almost fatalistically brilliant humor. . . . Here is a debut collection bold enough to cast an eye on Truth in poems that are both narrative (storied) and innovative, necessary poetry. “All angels pant as surely as they part”—Elizabyth Hiscox’s Reassurance in Negative Space studies the relationship between negative capability and communion. Between art and comfort. No rote reassurance is sought after or offered in these pages—the chocolate bunnies (better than Lent) are delicious but hollow. And after cataloguing and deeply considering the negative spaces of art—from the tiny details of a series of Japanese netsuke sculptures, to Archeology Today articles, to pieces of literature, music, architecture, painting—Hiscox breaks a tender heart with this equivocal and necessary advice for her reader: “Fall already, beautiful.” In this gorgeous and spiritually rugged ekphrastic book I do pant, I do part, and I do fall.